Buying a home is a major financial investment and could quite possibly be the biggest purchase you ever make. This is why it is so important to be financially prepared before you begin your application for a Hamilton mortgage. Schedule an appointment with a mortgage broker before you begin your home loan application, so you know what exactly is expected of you financially. Many first-time homeowners are unaware of all the additional costs associated with buying a home. Your down payment is probably your biggest upfront cost, however, there are several other closing costs that are required before you can claim your new home. So, to help you get started, your local Hamilton mortgage broker with the Canadian Mortgage Group, has listed some of the most common closing costs. Down Payment: The most well-known type of closing cost. Your down payment is a set percentage of the home’s appraised value. Title Insurance: This insurance is to protect the buyer in case there are any previous problems with the house that were not addressed before the move-in date. That way the new buyer is not held responsible for any previous problems. Land Transfer Tax (LLT): This tax is required for all homeowners who recently purchase a piece of property. If you live in Ontario, however, and are a first-time homebuyer, you will receive at least a partial break from having to pay this tax depending on the purchase price. Legal Fee: Working with a lawyer is essential in the homebuying process. This type of closing costs is whatever fees the lawyer charges for their services. Federal and Provincial Taxes: You may be required to pay the GST or HST if the price is not already including in the sale, when building a new home. Property Appraisal: Paying for a professional to come in and appraise the property is important so you know exactly how much the home is worth and is often required by the lender. Home Inspection: Paying for a professional Home Inspector to assess the condition and identify potential issues with your home, especially when purchasing an older home, is a wise investment. This could potentially uncover costly issues that could make you second guess proceeding with the purchase or could give you negotiating power to either adjust your offer or have any issues repaired by the current owner prior to completing the purchase. 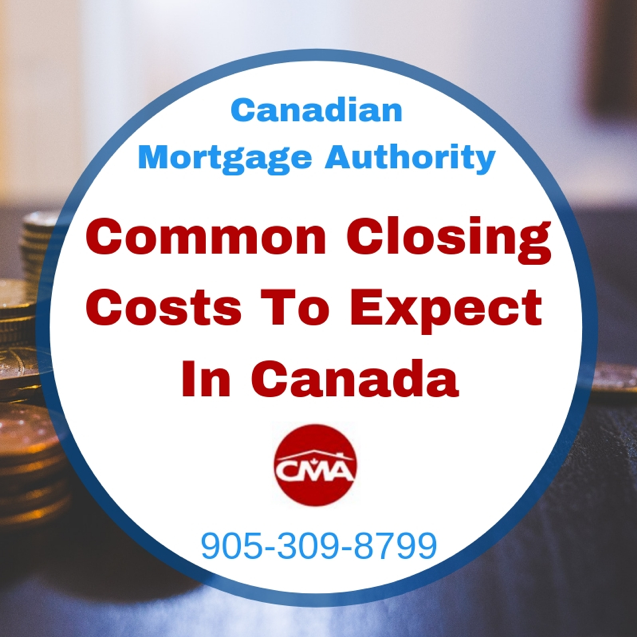 If you would like to receive more information on common closing costs in Canada or if you are ready to begin your home loan application, please contact your local mortgage broker in Hamilton with the Canadian Mortgage Authority at 905-309-8799.